Well kiddies, the weekend is upon us and there are lots of fantastic things for you to occupy your time with but I'm already focused on Sunday. 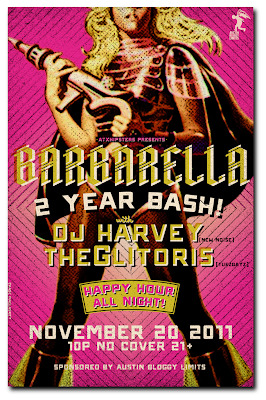 Our baby sister Barbarella is entering her terrible twos and she's throwing one hell of a party to celebrate. It seems fitting that Glitoris is soundtracking the night, since without Tuezgayz I might have never discovered what a bumpin' place Barbarella is to begin with. This isn't just Tuezgayz on a Sunday though, DJ Harvey will be bringing his New Noise as well. It all kicks off at 10pm Sunday night and the first 100 people through the door will receive a commemorative T-Shirt to help you remember you were there when the sun comes up on Monday. There's no cover charge but the party is 21+, happy hour is running all night so you can get $1 Lone Stars till it's no longer legal. Grab your best girl, guy, transgendered person, roommate, co-worker, acquaintance, ex-lover, future-lover, frienemy or foe and get your booty on the dancefloor. We won't let you out until your drenched with sweat and you have glitter in unknown places from unknown places. Join myself, ATXHipsters and theGlitoris for the best birthday for a 2 year old that you have ever seen. Oh, and don't forget parking meters are free downtown on a Sunday but with happy hour going all night, you should plan for sober transportation. Draw straws to decide who stays sober. Last but not least, if you have a smartphone, Barbarella is a Tabbed Out venue and that's a great way to NOT lose your credit card at the bar. 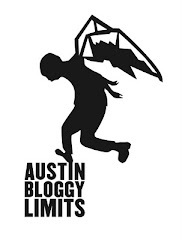 Make sure you RSVP on Facebook and you should "Like" this event on Do512 while you're at it. See you on the dancefloor!